Humans are a funny species. They create settlements along fault lines that, on moving, can create catastrophe, killing thousands. They construct homes facing rivers that will, at some point, break their banks, carrying of their precious property. Importantly, they return in the aftermath. Existence continues. The same follows certain settlements of parts of the planet where hostile, environmental conditions discourage rather than endorse a certain form of living. Changes in weather have been vicious catalysts for the collapse of civilisations; extreme climactic variations prevent and retard stable and sustainable agriculture. “The flourishing of human civilisation from about 10,000 years ago, and in particular from 7,000 years ago,” notes earth and paleo-climate scientist Andrew Glikson, “critically depended on stabilisation of climate conditions”. This had its due results: planting and harvesting of seed; cultivation of crops; the growth of villages and towns. Australia, the second driest continent on the planet, has never been exempt from such patterns of disruption, and those stubborn, pluckily foolish farmers who persist in the notion that they can make a living in parts of it risk going the same way. Of long dead farmers and soil’s red rust. But the gates were open and the drought walked through. The Settlement Drought (1790-1793) threatened but did not overwhelm early European settlers. The Goyder Line Drought (1861-5) savaged but did not kill farming in parts of South Australia. 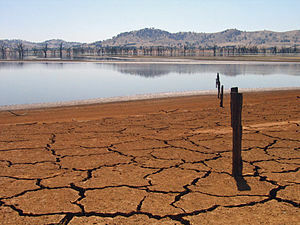 The recent Millennium drought (1997-2009) was spectacularly ruinous, but Australian agriculture moaned and stuttered along. Farming in Australia remains precarious, an occupation of permanent contingency. Droughts ravage, kill and annihilate. Crops and livestock perish with gruesome ease. But the Australian farmer, rather than being portrayed as a dinosaur awaiting extinction, is seen as resilient, durable and innovative. Yet each drought brings a certain narrative. One aspect of that narrative is the sense of singularity. Droughts are often seen as unprecedented. This alleviates the need to consider stark realities and inefficiencies that characterise the problem of farming in naturally dry environs with inappropriate crops or livestock, to up stakes, as it were, and finally admit to the brutalities. Such determination often flies in the face of the work conducted by climate science researchers, who tend to occupy a certain high terrain of gloom. Recent publications float the suggestion that the droughts this year may be some of the worst in 800 years. The response from the prime minister has been an urging against the predations of nature: to fortify “resilience” in light of more unpredictable rainfall. The fear from such figures as former Nationals leader John Anderson is that matters of climate change will be co-opted in an act of politicisation. This would suggest inevitability, doom and acceptance. Climate change watchers Andrew King, Anna Ukkola and Ben Henley do not shed much light on these matters, logically pointing out that drought, being a “complex beast” can be “measured in a variety of ways. Some aspects of drought are linked to climate change; others are not.” The entire field of drought studies reads like a sophisticated, taxonomical manual of expertise and foreboding, noting variations in their spatial effects, duration, seasonality and intensity. Drought brings with it a whole platoon of agents and variables. Cash relief payments are provided through the Farm Household Allowance (additional payments of up to $12,000 have been promised); mental health services are boosted (the Rural Financial Counsellors feature in this scheme). Australian farmers are being encouraged to come forth with their anxieties and strains. Perversely, as the federal government and a host or bodies tend to the drought, and as is in the manner of the Australian environment, northern stretches of the country have been and are being drenched. More flooding and cyclones are being promised in the future. Australia, that most untamed environmental miracle of all; but Australia’s agrarian inhabitants, permanently subject to trials they are often poorly prepared for, buttressed by an obstinate faith that sustains them. Thank you so much for this clear eyed and honest article Dr Kampmark. How many “unprecedented droughts will it take to realise a history of precedence? My grandparents brought a sheep station in Queensland back in the 50’s , grandfather sold the sheep as they were unsustainable in that area, full of melon paddies , the sheep had strpped the land of its natural vegetation and ring barked the trees so they died. We spent the next year during school holidays stick picking and fixing the fences and letting the scrub come back to life. We planted natives ,used the bore water and got the place back on its feet, all the time recording temperatures, rainfall etc. He brought a few stud herefords and went from there but the farmers around him did the reverse and brought more sheep striiping the land and creating dust bowls. Its all about land management, sustainable crops ,being ready for droughts that seem to go forever, keeping good weather records. While we have big companies growing unsustainable crops using irrigation 24 /7 we have no chance. The big feedlots are a another killer we need to change the way we farm, the amount of water we use, get support networks for farmers that are looking out for a sustainable crops for there particular area chickpeas, hemp, bamboo, ginger ……….stop using harmful pesticides,encourage beekeeping …. September 2016 Trangie residents on the Macquarie River complain of floods can’t access roads etc , Nyngan just down the road on the Bogan River floods 4 times during the same period and now there in drought and want assistance. Mmm what about the gold mines at Peak Hill and the turf farmers all along the banks of the Macquarie at Dubbo do they want assistance too and the cotton farmers pumping away at Narromine do the want money too. What happened to the Macquarie Marshes they ran dry and the native birdlife all but died out the Gin Gin weir stopped overflowing because someone used all the water mmmmmmm. No water, no life, it is as simple as that. Consequently, the “do nothing” approach of successive Federal Ministers for Agriculture and Water to ensuring proper distribution of MDB water is criminal. The cause is straight forward; in the late 1990s when the then Prim Monster intervened to prevent the Queensland government from forcing Cubbie Station to release water, he set a terrible precedent. Cubbie is majority owned by a Chinese Australian consortium and is reported as paying a mere $6,000 for water rights having constructed control banks to ensure that every drop of rain that falls on the Station, stays on the Station. The broad acre farmers of NW NSW realised that for a small donation to National$ Party funds they could continue to steal MDB water with impunity because no NLP state government would require change, and the ALP Ministers did not understand the simple complexities of mechanical water meters. Resolving the stolen flow of MDB water is as simple as installing 24/7/365 satellite metering on each and every water extraction pump along the rivers, with landholders responsible for ensuring that those meters monitor without interference, on pain of loss of access to water during pre-harvest. However, such “radical changes” should not be expected from the current incumbent having (distant) family members involved in broad acre farming, who are reported as defending charges of water use irregularities. To give some broader situational context to the current drought emergency, this extreme dry event is occurring in a period of Pacific oscillation neutrality, coming off the back of a relatively mild la nina. The BOM currently predict that spring through summer will more than likely herald the arrival of el nino conditions. Gird your loins, people, this looks like it might get very ugly indeed. Vixstar makes some interesting points. And New England Cocky adds some history. Yes, it is about rain and water.and about farm management as well, such as choice of stock, and when to sell. But has it been pointed out how few trees there are in an aerial view of drought-stricken land. Was there some once upon a time? If not, why not? Australia has a terrible record for land clearing and its attendant results, especially when the result is bad management over years. The book by Charles Massy, “Song of the Reed Warbler”, gives numerous examples of failing farms and ways and means for them to be saved – as they were, by the owners when they re-thought their farming methods. It is an eye-opener for demonstrating that there is more to farming than just putting a bunch of animals onto a paddock or running a seed drill over the ground. I’m not a farmer, although farming forebears have passed down information via generational family “back then” chitchat while I was growing up. However, I’ve read Massey’s “Song of the Reed Warbler”, and a number of permaculture “bibles” … and it’s all so wonderfully beautiful, and simple, to grasp what’s required to nuture your patch of dirt, and it’s ecosystem … if you have the desire to do so. Even in a suburban setting, the wildlife will come to tell you you’re getting it right, if you are. I love my carefully planned and planted unmanicured little patch of habitat. Also, google Insect Hotels … amazing! Seems like David Littleproud is doing his best to fill Barnabys size (10?) shoes. The default for a LNP ag & water minister is to deny climate change. Meanwhile huge coal mines planned in the Galilee Basin Qld promise in one case so far to give millions of litres of free water to distant mine owners, when towns are in drought. This is criminal in its greed and stupidity. Of course there are questions we might ask about how much climate change is affecting droughts, especially when Australia is a country which has drought as part of its history. But when we have had more than a dozen hottest years in this century so far, and people are saying the present drought is worse than they have seen, then we might have reason to think climate change has something to do with it, even if weather is not climate. In The Australian recently Ian Plimer has advised us: “Repeat after me: carbon dioxide is good for you.” It sounds a bit like Sheridan’s “God is good for you”. It sounds awfully like what the Right would call ‘politically correct’ if they did not believe in it so assiduously. Plimer claims there are two ‘fallacies’ associated with climate change. One is that CO2 drives global warming and the other that computer models can predict future climate. This last claim is based on his false claim the computer modelling has not predicted what actually happened. What he seems to be obliquely referring to there is the idea of a pause in warming since 1998. In fact, Michael Mann’s ‘Hockey Sick’ depiction of increased warming has been proven to be correct. So when Plimer tells us there have been greater levels of CO2 in the atmosphere and there have been ice ages, he doe not tell us over what period of time. It is a fudging of the facts. In fact, the level of CO2 in the atmosphere has risen since the beginning of the Industrial Age from 280ppm to 410ppm today (a 40% increase!). And we know human emissions play a big part in that when we measure the presence of carbon isotopes derived from the burning of fossil fuels. Another false question based on false facts is this: “Why should Australia be the only country out of step and aim for an impossible bankrupting reduction of 26% or more of our 2005 CO2 emissions?” Of course, Australia is not the only country looking to reduce CO2 emissions. Hence the Paris Agreement which the Right wants to drop. Much talk is made of Oz emitting only 1.3% of global emissions, but if 100 countries reduced their emissions each by 1% we would considerably reduce global emissions. Even China knows it must its reduce carbon emissions. But Plimer wants to burn fossil fuels because he is enmeshed in the mining industry and with Gina Rinehart’s business. His deluded propaganda is designed to try to protect the fossil fuel industry and the Coalition. That is why this deluded propaganda is shamelessly published in the Murdoch press. Plimer claims he wants to reduce the cost of electricity – but he must answer the question What is the cost of cooking the planet? A late comment but the drought conditions prevail so the topic is very much alive. I’ve been around for just short of 70 years and lived through a few droughts – albeit not directly affected. One thing seems consistent in the political and media reporting in such droughts is the unchallenged narrative that Australian farmers are essentially small scale family battlers – salt of the earth types, good old ‘real’ Aussies, Akubra hats and RM Williams atire. But is this how it really is or is this the emotional con that politicians like to capitalise on just as we have seen with Turnbull, Akubra on top, recently tugging for high emotional content? I don’t know – but any reading of global agricultural systems and methods dispels for me any notion that small family-level holdings are central to Australian agriculture. All high yield agricultural systems such as ours are industrial scale – corporatised – highly debt leveraged, usually monocultures saturated in glyphosate and other biocides and run by powerful off-farm interests. Methinks too much of Australian agriculture is flogging the land for export gain and not for domestic sustenance, and that Australian agricultural soils are in rapid and terminal decline as a consequence. Big ag equates with big machinery and big chemical and big water use. Why is the faming sector now suddenly putting out a collective hand when it could have seen a drought coming some time back – long term climate and weather forecasting and a 50,000 year history of repeated cycles of drought are factors for serious thought in any land management system – this drought is not a surprise. But grubby, pathetic and venal; politicians see only opportunity for votes and so they splash some cash – emotional feel goods – but always too late. The corporate and big business owners of so much of Australian agricultural production have the resources to address drought long in advance of where we are today. Let them stand up and foot the bill.